MOJO MONDAY @ Verve #281 - I chose some very festive colors and dsp for my card today. 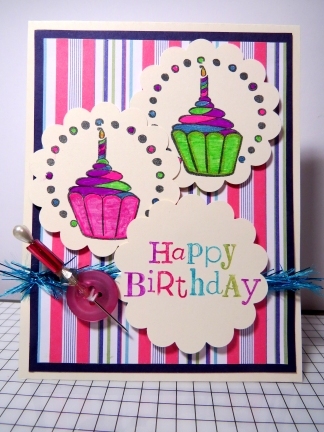 Loved the colors in the dsp so I ran with them on my cupcakes and sentiment. I'm quite pleased with the way it turned out. I also spotted Libby Hickson's blog where she used a stick pin through the thread on her button so, Libbykins, I borrowed your idea. Hope you all are warm, safe and having a very happy and color filled day!